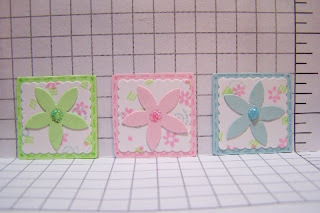 Here are my March inchies for the monthly inchie swap I am in. These are for group 5. The colors are 'baby blue', 'baby pink' and a 'bright green'. I did my own background paper so it would match. Stampin' Up! colors used: pink pirhouette, soft sky, and gable green.